When I left school I took a job at my local racecourse selling the tote books. It wasn’t a glamorous job as I walked around in my bright yellow jumper emblazoned with Tote Sales on the back of it. I did, however, enjoy my summer at the racecourse. Alongside having the chance to see the beautiful ladies dressed in amazing dresses and hats, I had the opportunity to learn about racing form and of course, enjoy a front row seat for the racing. Since my summer working at the racecourse I like to take the opportunity to visit the races every now and again, however, this time as a paying customer and one looking to pick all the right winners. This week is the start of the Cheltenham Festival and whilst I am not attending the race days it doesn’t stop me window shopping for the perfect race day outfit. Dress – As someone who is more of a pear shape I do love the range of Vivien of Holloway dresses. The beautiful range of 1940s and 1950s dresses offer that flattering shape along with some retro designs – simply stunning. Clutch Bag – Not wanting to carry much around a simple clutch bag will house all the essentials such as my phone, betting slips and money (hopefully leaving with more than I went with). This simple Jane Norman clasp clutch bag is from House of Fraser in the sale. Shoes – Attending the races means a long day on your feet so it is important that they are comfortable. The Antoinette Heels from Hotter Shoes offer both style and comfort, so I can rest assured that my feet will be looked after all day long. Sunglasses – I can live in hope that the sun will shine as we approach the first day of Spring. I’ve got a thing for Ted Baker sunglasses as they have a style for every occasion. These are the Blair style sunglasses and I love the round, soft frames – they remind me of Audrey Hepburn. 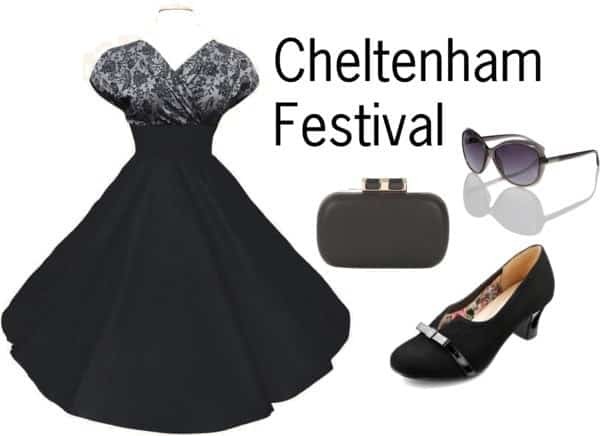 What would your outfit of the day be to the Cheltenham Festival?